Growing up in the province of Masbate, and eventually living in Manila for my college education, I am used to living with regular visits of strong typhoons. I grew up knowing that there are about 20 typhoons that visit and devastate our country each year. Typhoons, used to have women's names, (Reming, Juaning, Neneng) until we ran out of local female names that the weather bureau held a name-that-typhoon contest. We now have more variety of names to choose from like Falcon, Dodong, Egay, Kabayan etc. The worst thing, for me, as a kid, the rainy season coincides with the school year opening. Most of the times, we haven't started our lessons, and there will be announcements of several days of No Classes. Sometimes, when they suspend classes late, I would to school in slippers because I don't want to ruin my new school shoes. Then, go home again, walking in floods to my thighs. That's they early 80s in the Chinatown, Manila. Nowadays, the flooding in Manila is chest-deep! My hometown in Aroroy, Masbate runs right smack into the typhoon path coming from the Pacific. We are a mountainous region, there's not much flooding but we would have typhoons that blew rooftops away! In my adult life, the most recent worst typhoons was in 2009 (when I just 8months pregnant with my youngest girl), Typhoon Ondoy (International name : Ketsana) left almost 400 dead, Tyhoon Sendong (International name Washi) left almost 1000 dead. Recently, there has been an anomaly in nature, we didn't have a typhoon but we had a strong Southeast Monsoon or Habagat. In fact, we didn't even have a name for it, so we just called it Habagat. Habagat devastated Manila and nearby suburbs last August 7-8 with relentless strong torrential rains. We had more than 10 days of continuous rains. There were flooding all over the city. People were evacuated into schools for temporarily shelters. Eventually, various organizations and individuals mobilize themselves to reach-out to the victims of typhoons. Relief packs are distributed by the thousands. A relief pack usually consist of instant noodles, rice, sardines, corned beef, and used clothing. Filipinos are really good at this! Even if people say we have crab mentality and all.... the Bayanihan Spirit still reigns. This brings me to my next point. After all our initial relief efforts, I hope our organizations would consider a more nourishing sustenance for the children of these calamities. Let's face it, many of our children in the slum areas, and even majority of our public school pupils are malnourished. Many of them are underweight, easily get sick easily and don't do well in school. VitaMeal is vegetarian and non-dairy, and allows for the easy addition of ingredients to fit every taste and culture. It is a meal by itself, but some would cook it with spaghetti (substitute the beef), porridge, sweet snacks with coconut milk, among others. 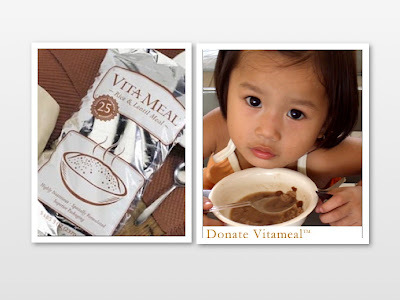 Each VitaMeal package can be use for 30 child-sized meals, or enough food to provide a child with one nutritious meal each day for a month. The cost is 1,600 php per bag. A bit costly, but if you will consider that it's not just a meal, it's a multi-vitamin in itself, it's really worth it. Besides, there's really improvement on the overall health of the child. This has been tested in feeding programs in Africa and China. If you're interested, you can buy the Vitameal pack for yourself or for your organizations. Alternatively, you can just sign a donation form and your donation will be given to Feed the Children Philippines. It's the organization that conducts the feeding all over the country. You can just talk to the person who sent you this link or contact directly Nu Skin Enterprises Philippines with offices at 15th floor Octagon Building, San Miguel Avenue, Pasig City, Philippines, with telephone numbers 632-8-NUSKIN.